Its a snow day here in Michigan thanks to 10 inches of snow that we got over the past 24 hours. The kids have already been out burrowing in the big piles and sledding with their friends. Now they, and their friends are all in here playing and want a snack. What's a mom to do? 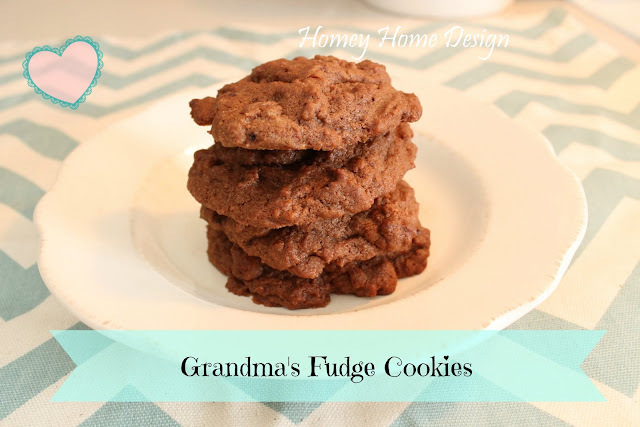 Bring on the fudge cookies! Cream together the sugars and shortning. Add the eggs and vanilla and beat. Mix in salt and cocoa then add baking powder and flour. Mix until combined. Drop onto greased cookie sheets and bake in a 400 degree oven for about 10 minutes. And enjoy their warm yummyness! What an awesome mom you are!!! These look yummy! We've had hardly any snow this winter. Thanks for sharing this at my Pin Me Linky Party.